American Registered Bombardier BD-100-1A10 Challenger 300 Bizjet N1013 Departs Mackay Airport - Plus More! 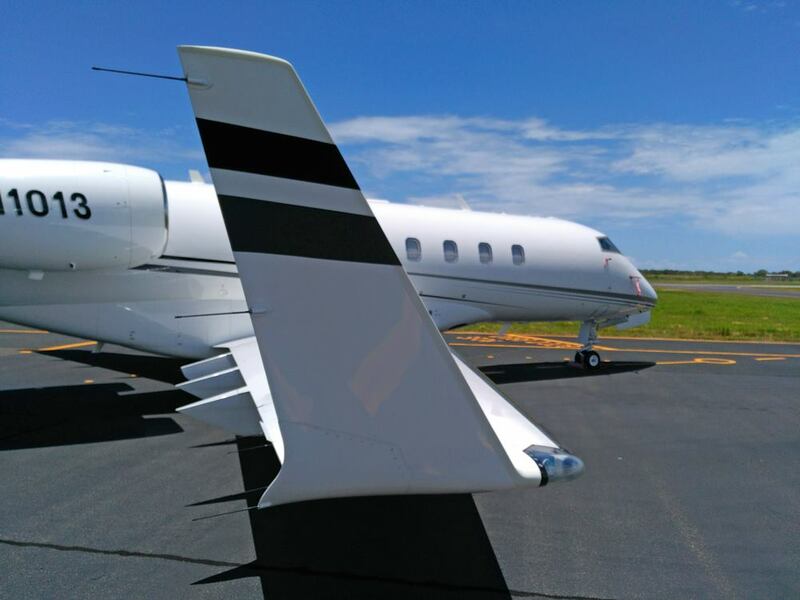 On Saturday 30 December, the visiting American registered Bombardier BD-100-1A10 Challenger 300 bizjet N1013 was noted departing Mackay Airport. 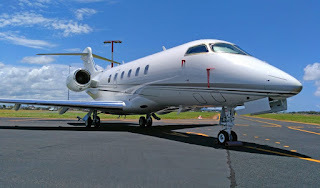 It made the short hop back to Hamilton Island Airport before departing a short time later for Darwin. 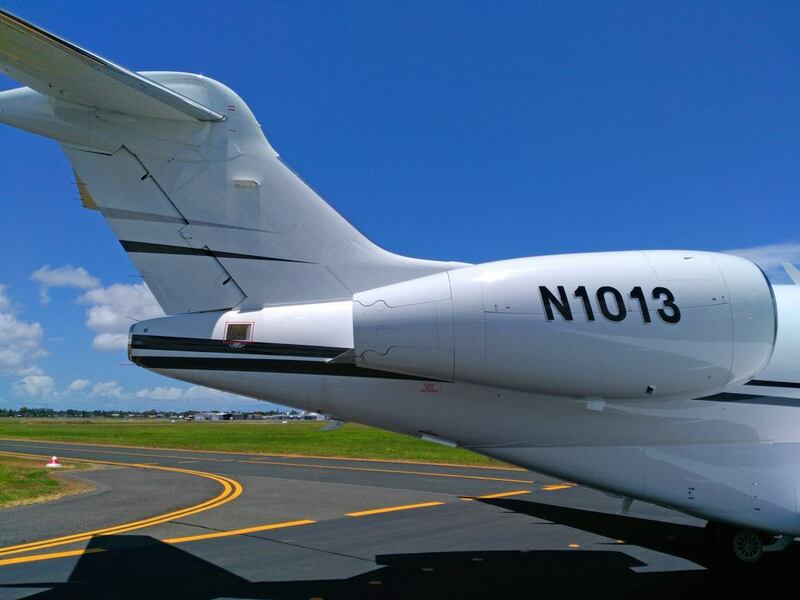 N1013 had arrived into Mackay Airport from the Gold Coast via Hamo on Wednesday 27 December. 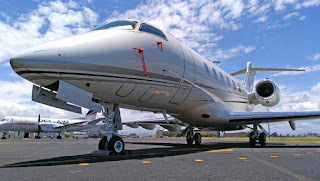 Also on Saturday 30 December, the familiar sight of Balmoral Air Dassault Falcon 2000LX bizjet VH-WIO was back at Hamilton Island Airport. 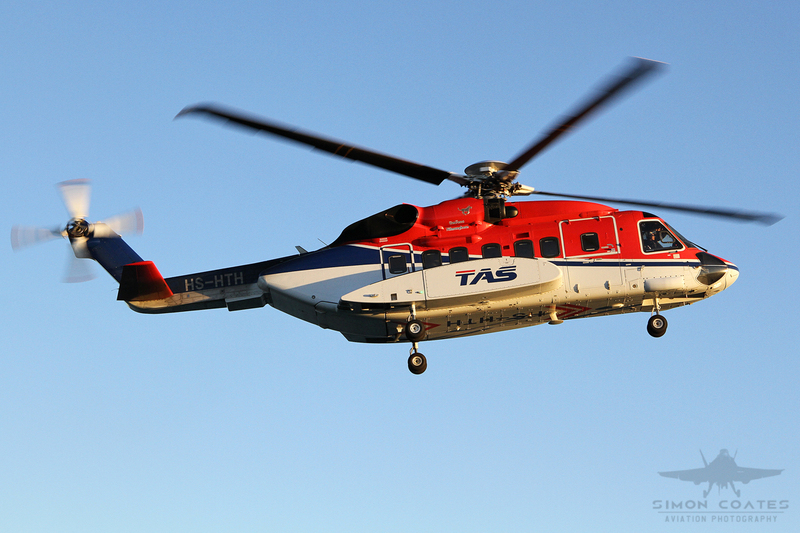 It arrived from and then departed back to its Bankstown base. 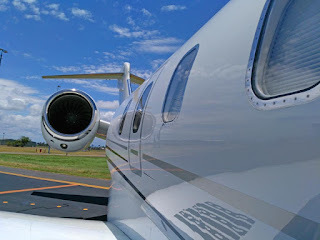 Meanwhile, also on Saturday 30 December, Edwards Coaches Cessna 525 Citation CJ1 bizjet VH-KXL was noted visiting Hervey Bay (Fraser Coast) Airport. It arrived from its Armidale base via the Balina / Byron Gateway Airport before later returning directly to Armidale. 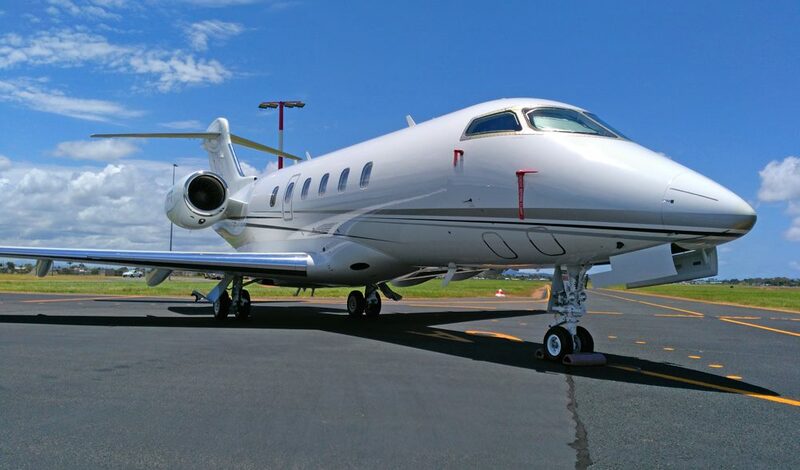 Back on Hamo, on Friday 29 December, Business Aviation Solutions Dassault Mystere Falcon 50 bizjet VH-FJQ was noted departing Hamilton Island Airport for Sydney before continuing to its Bankstown base. It had arrived from Bankstown via Bathurst on Tuesday 26 December. Finally, late on Friday 29 December, LifeFlight (Aeromed) LearJet 45 bizjet VH-CXJ "Ambulance 452" called into Mackay Airport from Brisbane. 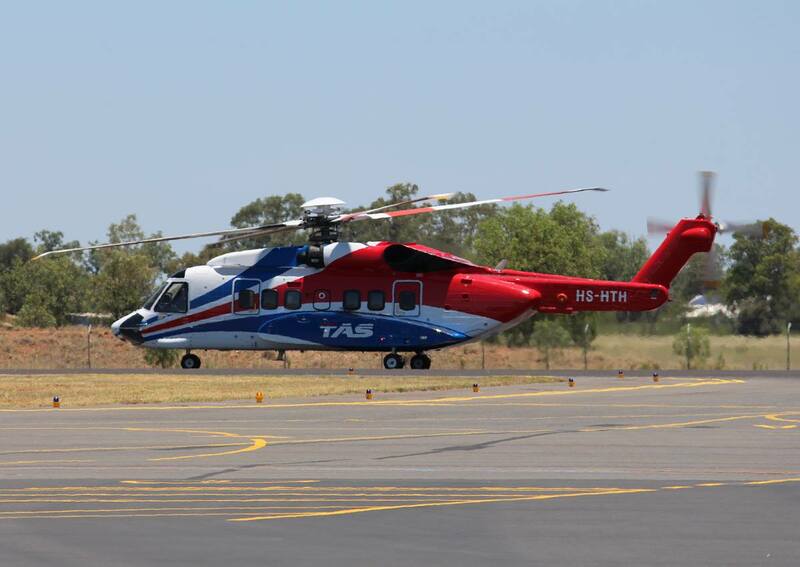 It looked to be completing a medevac flight and departed to Townsville after around an hour on the ground. 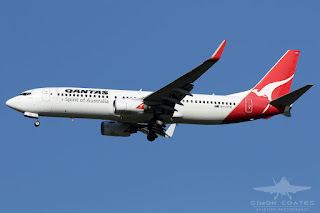 On Friday 29 December, Qantas Airways Boeing B737-800 VH-VYG made its first visit into Central Queensland after it had been re-painted into the airline's new 'Silver-Roo' colour scheme. 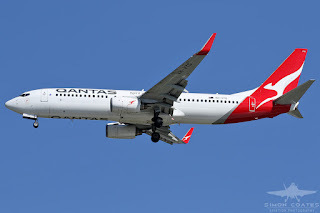 VH-VYG was noted arriving into Hamilton Island Airport from Melbourne (Tullamarine) as QFA870 and marks the second time that the new and updated Qantas livery and kangaroo logo has appeared in CQ on a Qantas B737-800. Of interest, VH-VYG was re-painted in Singapore during late-August / early-September and joins several other B737-800s in the Qantas fleet which have had the new livery applied. Research also reveals that VH-VYG was one of the last B737-800s in the Qantas fleet that wore the very old 1984-style Qantas livery. 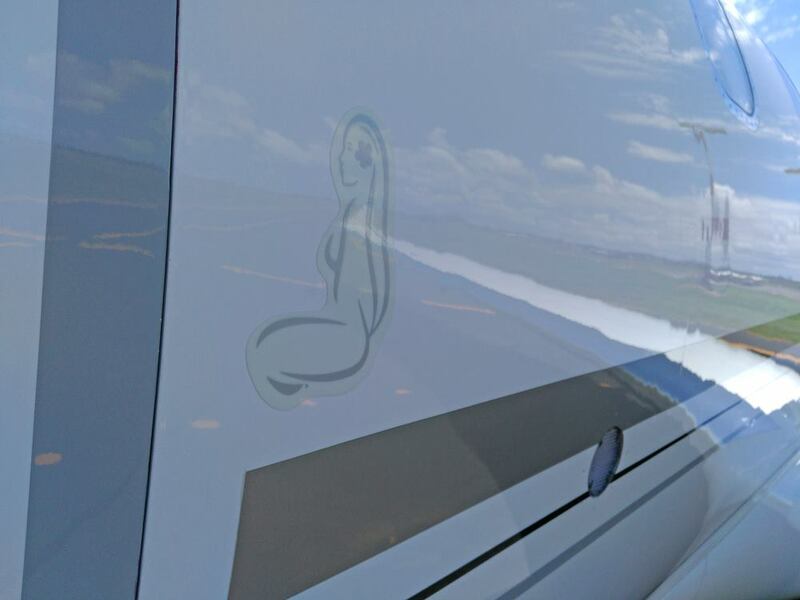 Now, with as many as eight of the current Qantas Boeing B737-800 fleet now adorned in the new 'Silver-Roo' livery, we hope to start to see a few more pop into CQ at Hamilton Island Airport over the coming months! During the afternoon on Wednesday 27 December, a massive storm passed through parts of Central Queensland with a concentrated cell hitting Emerald during the middle part of the afternoon. 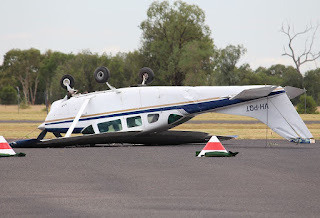 At Emerald Airport, Privately owned Cessna U206 Super Skywagon VH-PQT was flipped by gust of wind and was spotted resting on its roof with substantial damage to the wings and tail. 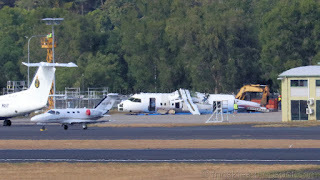 As these photos, which were generously shared by local plane spotters show, VH-PQT remains on the Emerald Airport General Aviation (GA) apron on Thursday 28 December (as shown below). 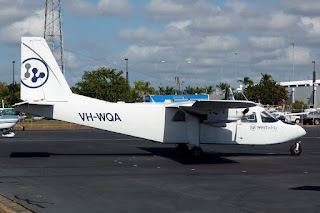 Of interest, VH-PQT was first registered in October 1965 (ex N8027Z). 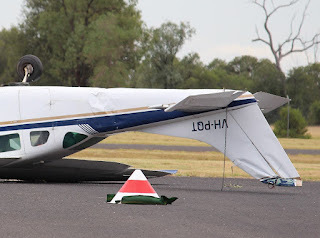 It has previously been operated by Meredith Air Charters, of Meredith, Victoria, and was used for skydiving at various places including Corowa before being invilved in an incident at Meredith in 1985 when it landed long and overran the runway. 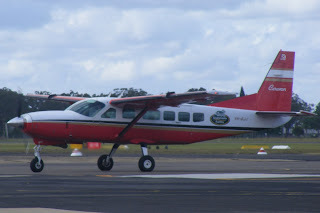 VH-PQT was later modified for aerial mapping and based at Archerfield with Australasian Mapping Services from 2007. 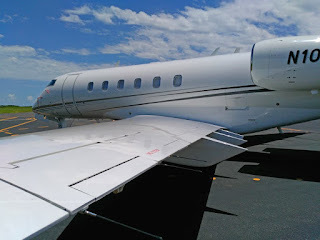 Its current operating status in generally unknown as it remains registered to the proprietor of Australian Mapping Service, but to my knowledge has rarely taken to the air and remained parked on the ground at Emerald Airport. 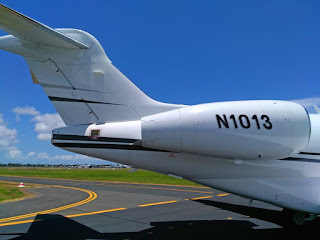 American Registered Bombardier BD-100-1A10 Challenger 300 Bizjet N1013 at Hamilton Island and Mackay Airports - Plus More! 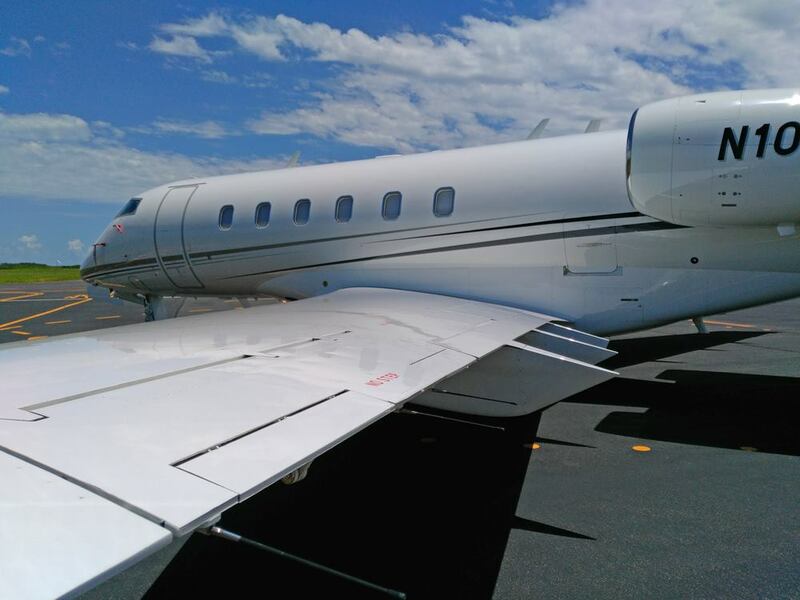 On Wednesday 27 December, nice American registered Bombardier BD-100-1A10 Challenger 300 bizjet N1013 was noted arriving into Hamilton Island Airport from the Gold Coast. 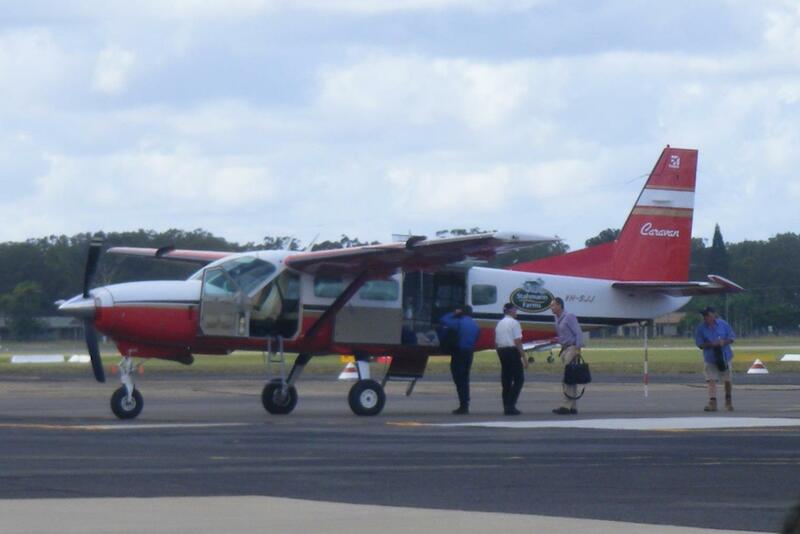 After parking for around an hour, it departed to Mackay Airport where it looked to be parking up for a couple of days. 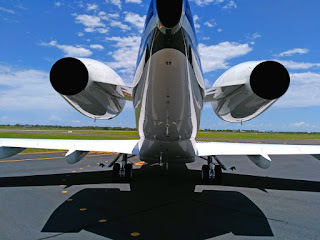 Also at Hamilton Island Airport, also on Wednesday 27 December, Gandel Investments (The Gandel Group) Bombardier BD-700-1A10 Global Express VH-TGG was noted visiting for a couple of hours from its Melbourne (Essendon) base. 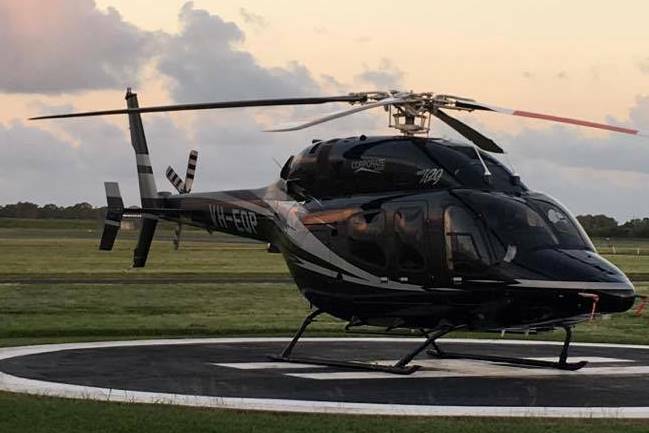 While a familiar corporate helicopter in the form form of Corporate Aviation Bell 429 helicopter VH-EQP touched down at Hamo also on Wednesday 27 December from its Southport Base via a fuel stop at Gladstone Airport. On Tuesday 26 December, Business Aviation Solutions Dassault Mystere Falcon 50 VH-FJQ was noted arriving into Hamilton Island Airport from Bankstown via Bathurst in New South Wales. It appears to have remained parked over on Hamo. 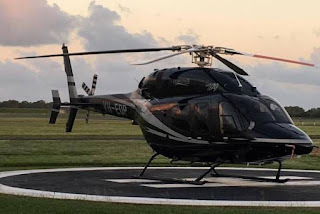 While another nice helicopter was spotted calling into both Mackay and Gladstone Airports also on Tuesday 26 December, in the form of Skyhook Helicopters (of Salamander Bay in New South Wales) Eurocopter EC130B4 helicopter VH-JRD. Finally, on the very lighter side of aviation movements - and maybe not quite corporate movements but private movements none-the-less - a pair of Amateur-built Sling 4 ultralight aircraft registered VH-VWC and VH-VAZ were noted arriving into Hamilton Island Airport from their Archerfield base via a fuel stop at Gladstone Airport also on Thursday 29 December. Both look to have remained parked on Hamo as well. Thai Aviation Service Sikorsky S-92A Helicopter HS-HTH Passes Through Emerald Airport - Heading Home! On Monday 25 December (yes Christmas day!) 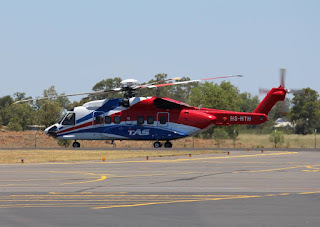 Thai Aviation Service (Thailand) Sikorsky S-92A HS-HTH was photographed at Emerald Airport by local plane spotter Greg W.
It is pictured departing Emerald for Normanton after earlier arriving directly from the the Helitek Helipad in Brisbane. HS-HTH has been in Brisbane undergoing planned maintenance since it ferried into there, again via Emerald Airport, in September - as pictured below. 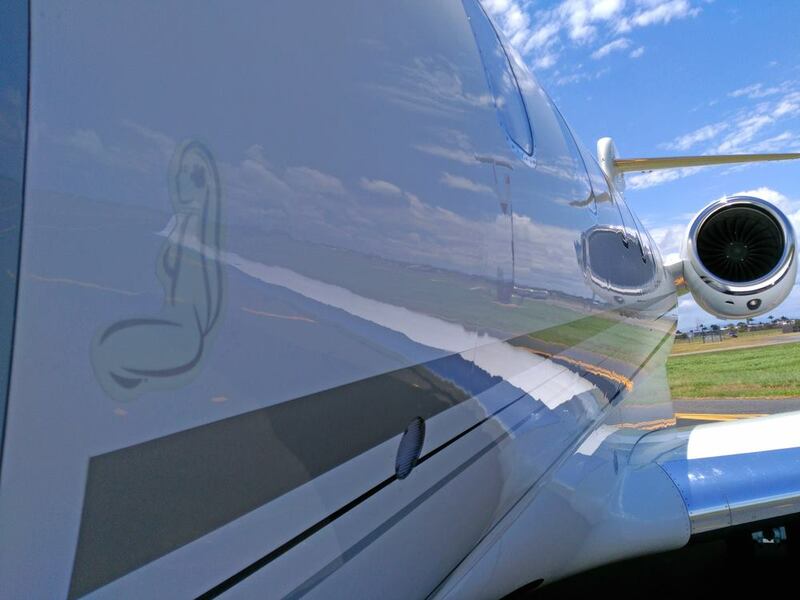 At the time of writing, HS-HTH has continued from Normanton to Groote Eylandt and Darwin in the Northern Territory on Tuesday 26 December. Sincere thanks to local plane spotter Greg W for taking the time to capture and send through these great photos of a great helicopter visitor to call into Emerald Airport! 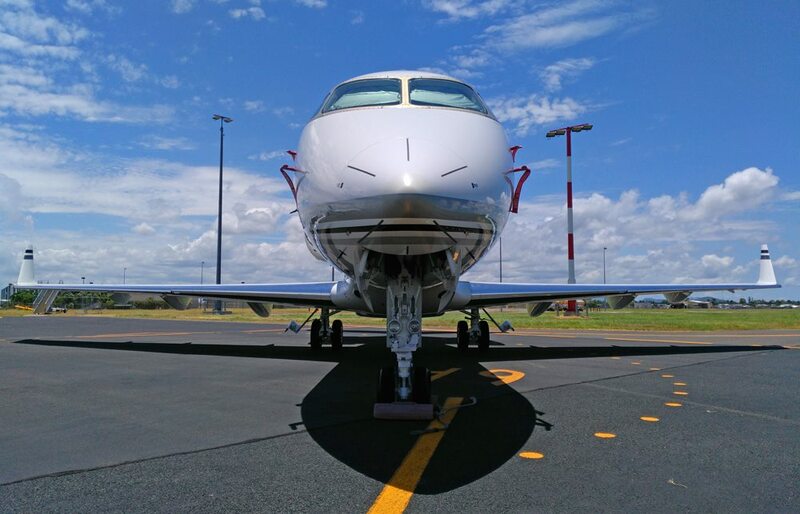 On Sunday 24 December, Vanguard Aviation Cessna 525 CitationJet1 bizjet VH-DAA was noted arriving at Hamilton Island Airport from Archerfield. 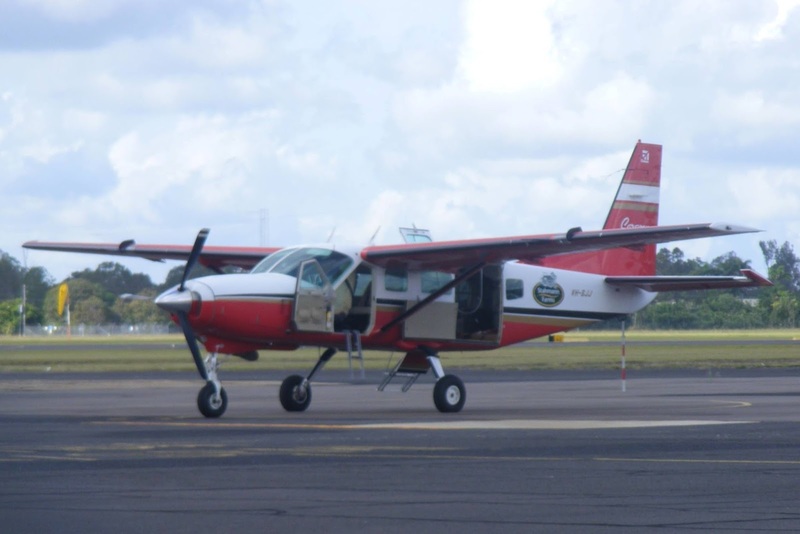 It appeared to spend the night and was noted making the short hop down to Mackay Airport late morning on Monday 25 December. 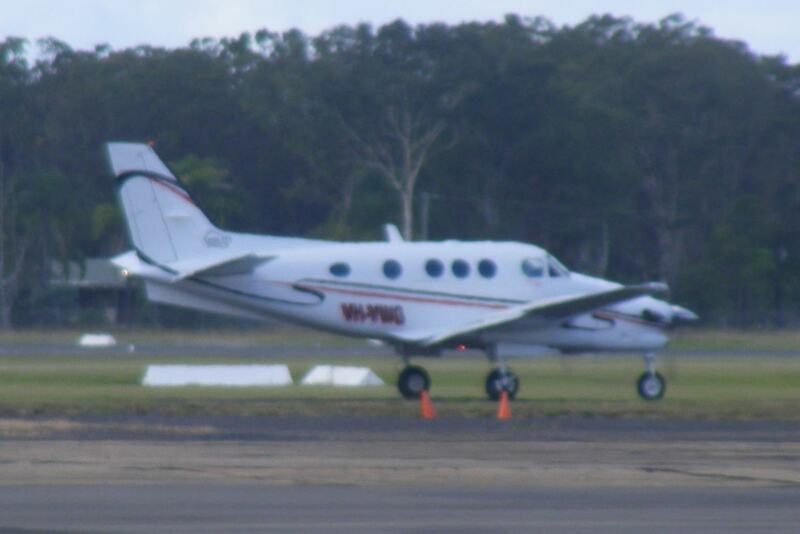 After about an hour on the ground, VH-DAA returned to Hamo before later departing back to Archerfield. On Saturday 23 December, Edwards Coaches Cessna 525 Citation CJ2 bizjet VH-RJB was spotted on the ground at the Whitsunday Airport at Shute Harbour. It had earlier arrived from Armidale via Sydney. 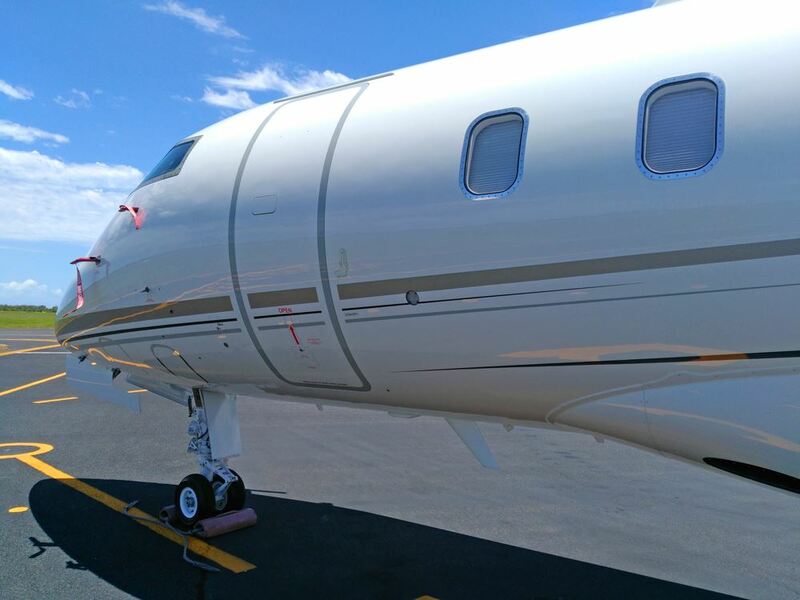 After being refuelled, VH-RJB returned to its Armidale base. Meanwhile, a very attractive local 'warbird' in the form of Mackay-based Yakovlev Yak-18T VH-IBT was also spotted at the Whitsunday Airport also on Saturday 23 December. The Russia built warbird is powered by a single Vedeneyev (Ivechenko) M-14P Piston engine. 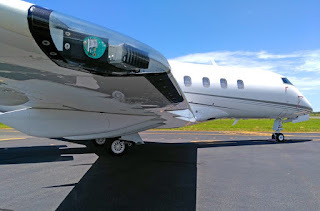 It was also interesting to note that VH-IBT has its past registration marking (CCCP-44293) and home-country (Kazakhstan) under its current registration marking. 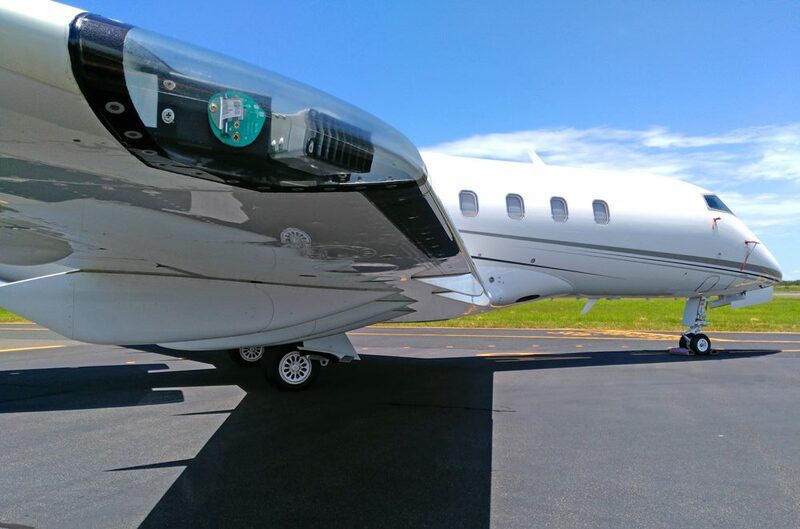 There is also an import badge for Red-Star Aviation. 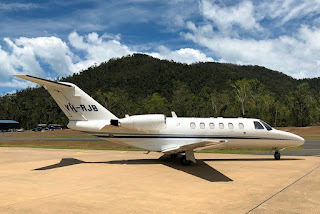 Finally, over at Hamilton Island Airport, also on Saturday 23 December, Graham Aviation Cessna 510 Citation Mustang bizjet VH-FNI flew in from Cairns. 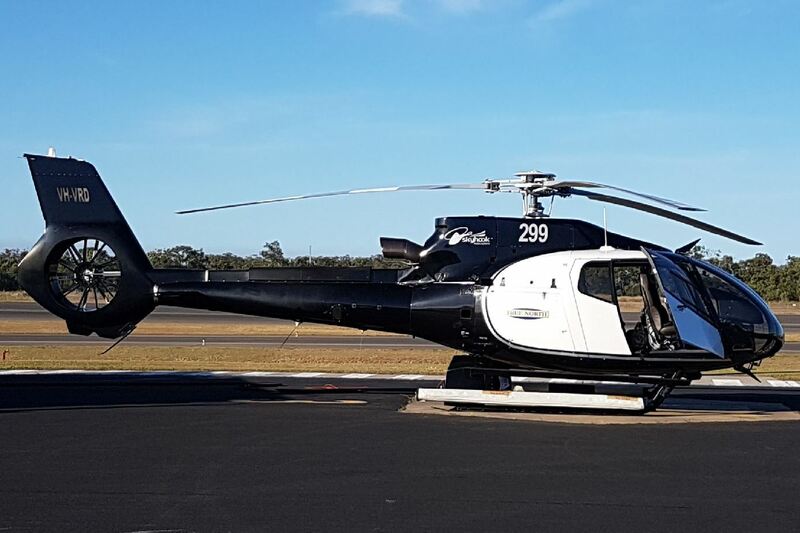 After a little while on the ground, it departed back to Cairns before continuing to its Mareeba base. While Shortstop Jet Charter Dassault Falcon 900C VH-OAA has visited Hamo once again (now making almost daily flights between Hamilton Island Airport and its Melbourne [Essendon] base) arriving on Friday 22 December and departing on Saturday 23 December. Very late on Saturday 23 December, McGilvray Aviation (West Wing Aviation) Pilatus Britten-Norman BN2A-21 Islander VH-WQA was noted calling into Rockhampton Airport from Townsville. 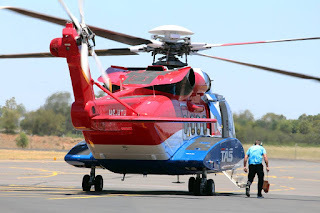 After taking on fuel, it departed to Archerfield where I assume it will be undergoing planned maintenance. VH-WQA had arrived into Townsville from Mareeba late on Friday 22 December and I presume from planned flights that its journey South was delayed by a day. 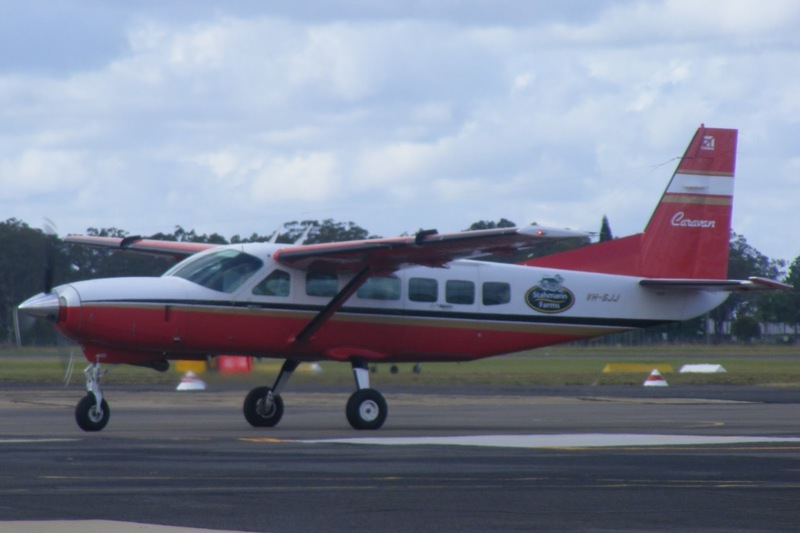 Meanwhile, also popping into Rockhampton Airport, but much earlier on Saturday 23 December was Rolleston-based Cessna 310 VH-XBB. 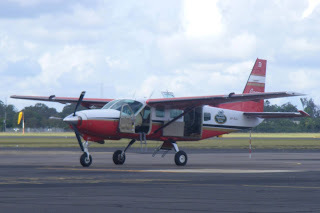 It arrived from Consuelo Airport (South of Rolleston) and departed to Archerfield. 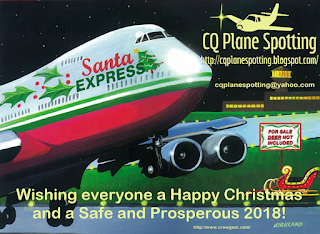 Seasons Greetings from the Central Queensland Plane Spotting Blog!! We here at the Central Queensland Plane Spotting Blog (CQ Plane Spotting) would like wish all our valuable Blog readers and contributors from Australia and around the world a very Happy Christmas and a Safe and Prosperous New Year 2018!! While researching for the Blog post about the recent scrapping of a pair of Skytrans Airlines Dash-8-100 aircraft - see below - I also discovered that a couple Super King Air turboprop aircraft that have frequently visited Central Queensland have recently left Australian skies and departed to new owners and operators overseas. 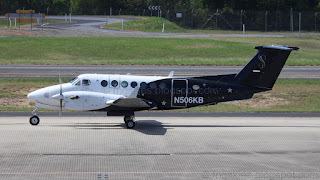 Sutherland Aviation Raytheon B300 Super King Air VH-WXC (msn FL-506) was a frequent visitor to different parts of CQ after it was delivered to Australia from Great Britain in early 2011 as G-POWB. VH-WXC was cancelled from the Australian register on Thursday 26 October after it was sold in the United States of America (USA) and re-registered as N506KB of Aerosolutions Group at Wilmington, Delaware. It was photographed above at Cairns Airport on Monday 6 November where it arrived from Bankstown and later departed to Biak (Indonesia), Saipan (Northern Mariana Islands) and Tokyo (Narita) where it arrived the next day. 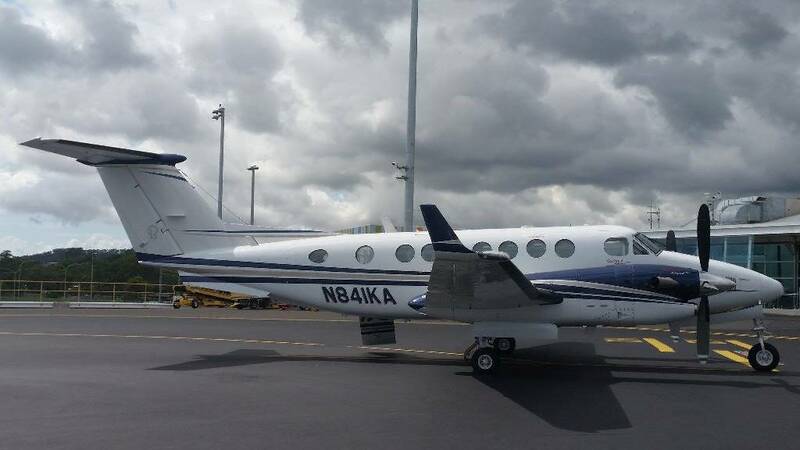 Meanwhile, Brisbane-based Hawker Beechcraft 350i Super King Air N841KA, which was registered to Ballard Aviation of Newton, Kansas, departed Brisbane for Port Moresby on Sunday 8 October before continuing to Guam and Osaka (Kansai) in the days after. N841KA has since flown through Alaska into mainland USA. As I've said before, I do find this sort of stuff fascinating! 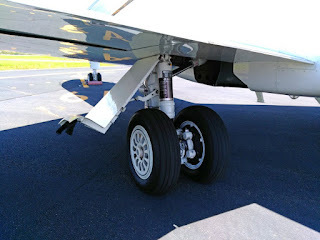 Sincere thanks to the FNQ Skies Blog for their assistance in compiling this post! 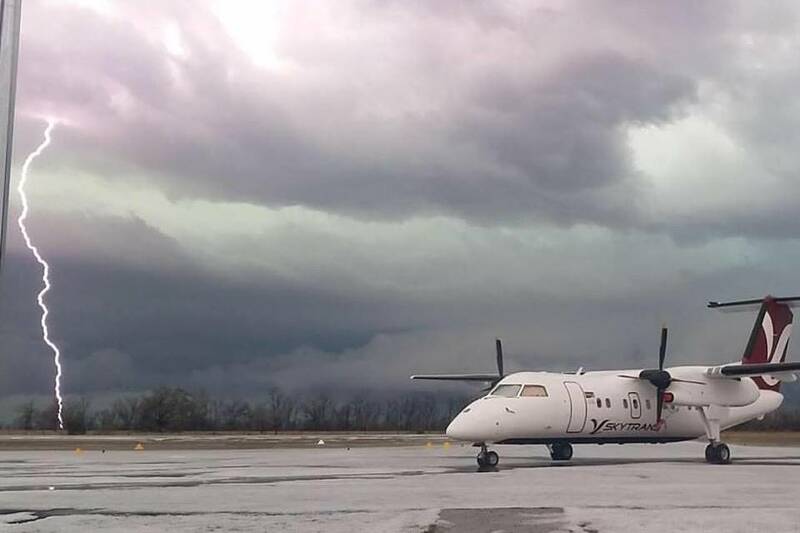 During the Winter months, we often see Skytrans Airlines Dash-8-100 aircraft pop into various CQ Airports usually transporting local sports teams around Queensland to participate in State-based sports competitions. 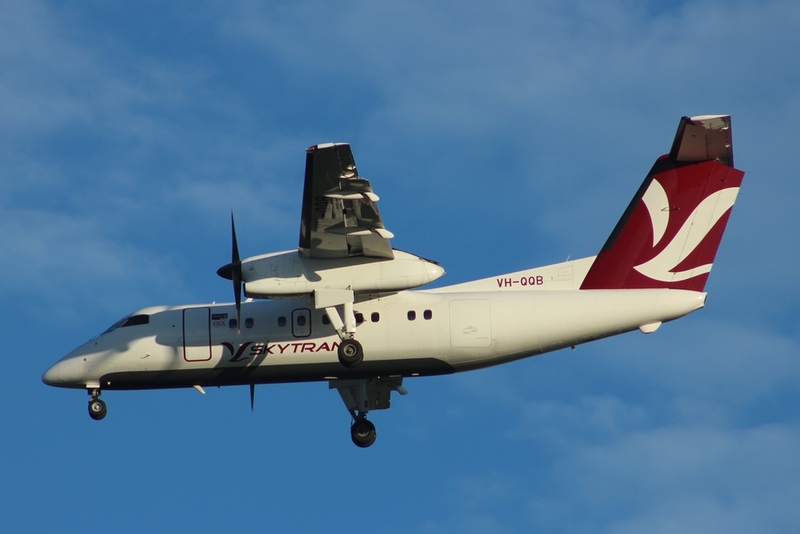 As well as continuing to operate Regular Passenger Transport (RPT) flights based at Cairns Airport, I also noted this recent photo of Skytrans Dash-8-100 VH-QQB flying into Brisbane Airport on completion of one of its many FIFO charter flights to and from Taroom or Chinchilla Aerodromes. 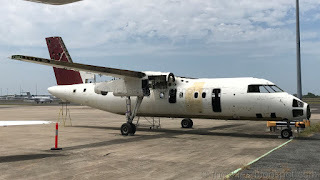 Meanwhile, over the last few months, the fantastic FNQ Skies Blog has posted photos and information as a pair of Skytrans Dash-8-100s were cut-up and scrapped at Cairns Airport. 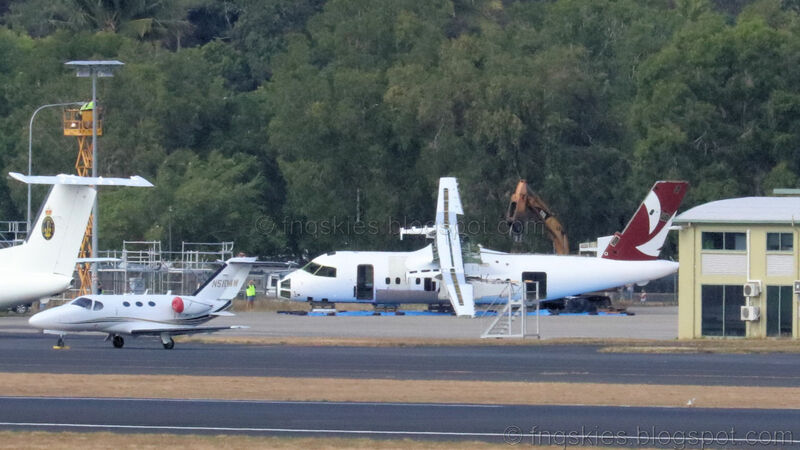 Dash-8-100 VH-QQA was photographed being scrapped at Cairns Airport on Saturday 16 September. The aircraft was damaged by a violent hail storm while on the ground at Chinchilla Aerodrome in late October 2015 and after initial assessment, it was ferried to Cairns via Roma Airport in November 2015. This turned out to be its last flight, as VH-QQA has never re-entered service with Skytrans. VH-QQA operated RPT services from Cairns Airport to the Gulf and Cape York between 2011 to 2015. Prior to this time, it also operated with Maroomba Airlines out of Perth Airport in Western Australia. Meanwhile, Dash-8-100 VH-QQC was photographed below partially scrapped in Cairns in early October and was then de-registered on Monday 16 October. 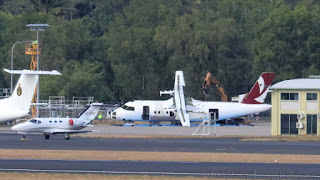 VH-QQC has been stored at Cairns since late October 2014 and reportedly last flew with Skytrans on in late October 2014 as SKP67 from Mount Isa to Cairns. 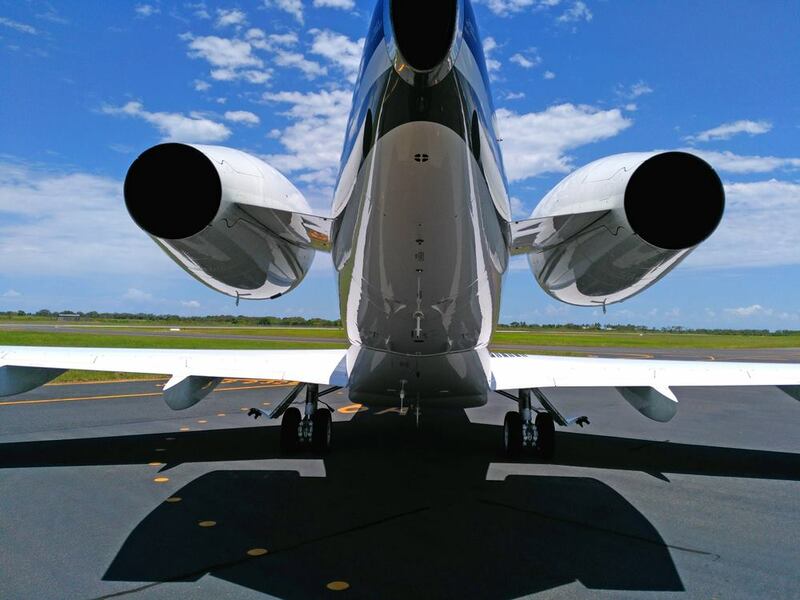 On Thursday 21 December, Royal Australian Air Force (RAAF) Airbus A330-203 / KC-30A (MRTT) A39-004 was spotted climbing out after completing a missed approach and low overshoot at Rockhampton Airport. The KC-30 had earlier flown South to Rocky from Darwin via Cairns. 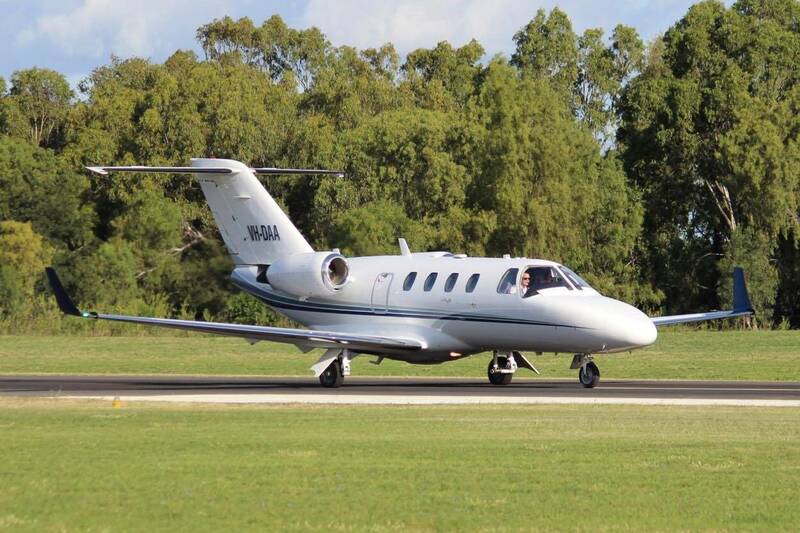 After completing the missed approach, A39-004 was heard to depart to RAAF Base Amberley. 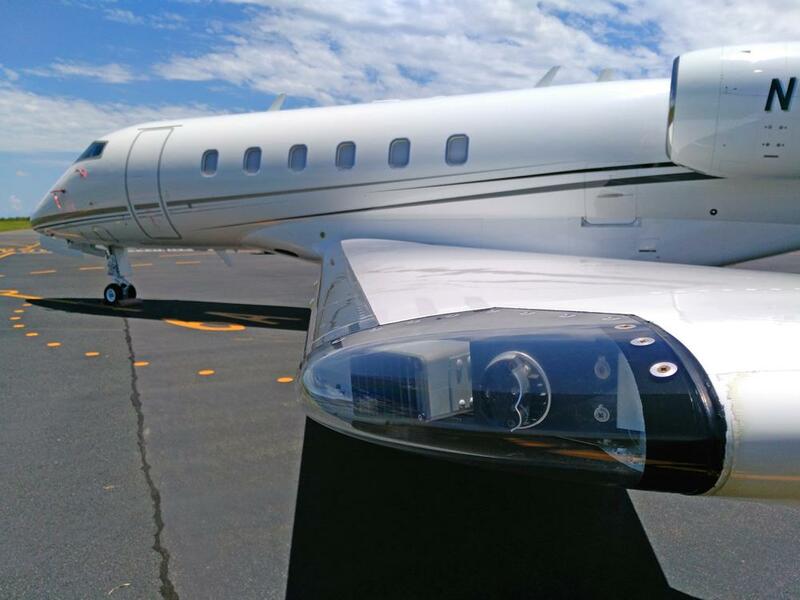 A39-004 was heard to be using the radio callsign of "Dragon 23". 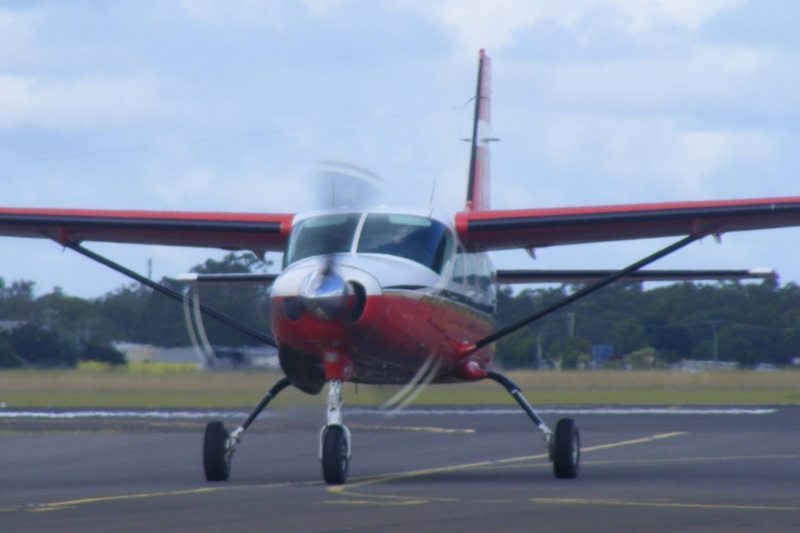 Early on Thursday 21 December, Toowoomba-based Bontrail (Strahman Farms) Cessna 208 Caravan VH-SJJ was spotted soon after arriving at Bundaberg Airport. 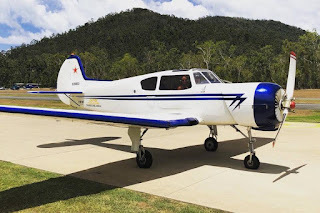 It touched down from Toowoomba after earlier completing a dawn flight to the Balina / Byron Gateway Airport in Northern New South Wales and back. After spending much of the day parked, it returned to Toowoomba later in the day. It is then due to fly to Brisbane, Balina and then back to Toowoomba. A busy day! Also spotted departing Bundaberg Airport early on Thursday 21 December was Wolff Aviation Hawker Beechcraft C90GTi VH-VWG. 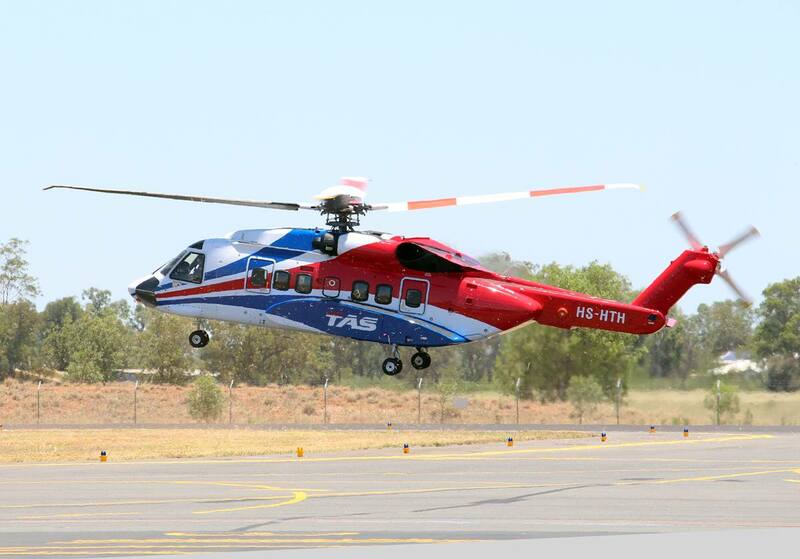 It was believed to be flying to its Toowoomba base, after arriving from there a little earlier in the morning. 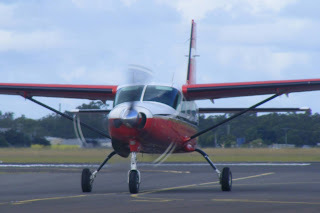 It was also interesting to note that late in the afternoon on Thursday 21 December, beautifully presented 1959-build De-Havilland Canada DHC-2/A1 Beaver VH-AAX ferried into Bundaberg Airport from Innisfail and Bowen. 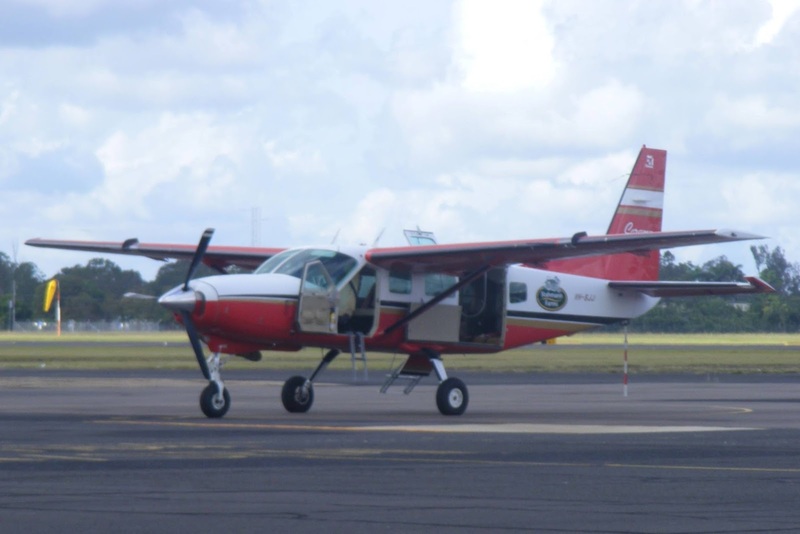 The Beaver is used for parachuting operations in North Queensland and could be ferrying back to New South Wales where it is registered with the Sydney skydivers. Finally, up at Rockhampton Airport, Brescon P/L Beech B200 King Air VH-WXB called in during a busy day of flying also on Thursday 21 December. 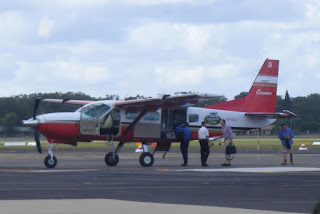 It arrived from the Toowoomba West Wellcamp Airport via Warwick. 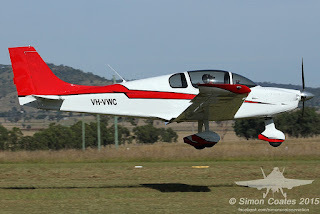 VH-WXB is scheduled to return to Warwick and Wellcamp early on Friday 22 December.